There is a legend that a Great Spotted Whale lives in the ocean; local fishermen still talk of it, although the first sighting fifty years ago was never corroborated. 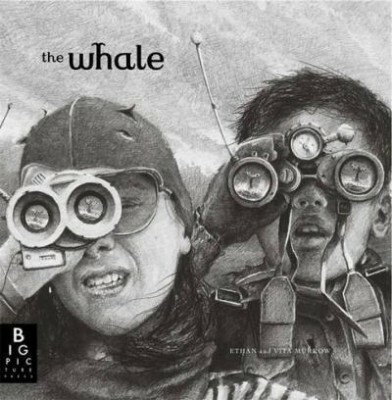 Now, two young whale watchers each set out to find the whale, one armed with sound recording equipment, the other a camera. Mid-ocean their boats collide, so they pool their resources and set off together to capture incontrovertible proof that the mythical Great Spotted Whale exists. The eventual sighting is a magical moment: the whale is truly phenomenal, and swimming along beside her are two small whale calves. The children return to shore, solid proof in hand. As an added twist to the story, they discover that it was their own grandparents who first sighted the Great Spotted Whale fifty years ago. The Murrow's epic, wordless adventure is brought to life with Ethan's stunning graphite drawings, which convey the drama and haunting beauty of the ocean, and capture the majesty of this awe-inspiring creature.